Please scroll through these delicious recipes from our Western friends. 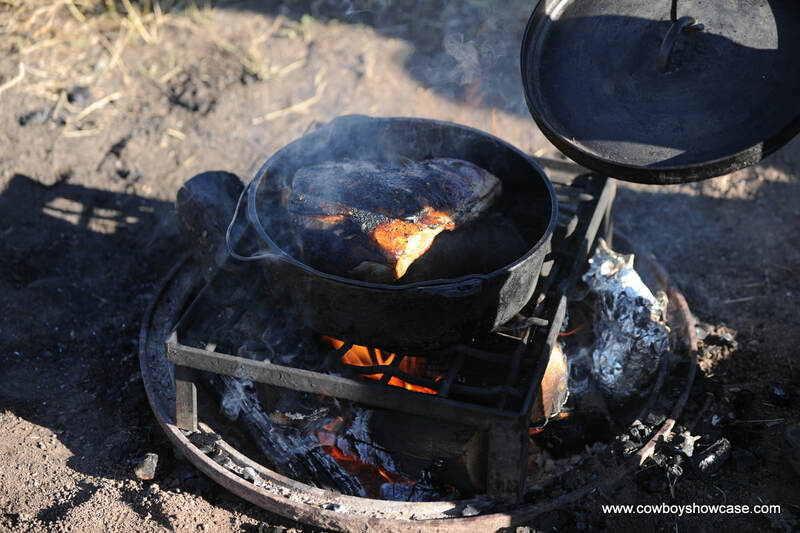 Hope you like the chuckwagon, sourdough, and Dutch oven cooking pages, too. If you have a favorite recipe, please share it with us. The following instructions for roasting and freezing green chile are adapted from information provided by the New Mexico Department of Agriculture. Choose chile that is bright green, smooth, symmetrical, heavy for its size, mature, and crisp. Wear rubber gloves when handling chiles to protect hands and provide adequate ventilation while roasting or peeling. Roasting or blistering the chile will remove the tough outer skin which can then be removed before or after freezing. Removal of the skin is easier after freezing. Place chiles in a hot oven or broiler at 400 degrees F. for 6-8 minutes or until skin blisters away from the flesh of the chile. 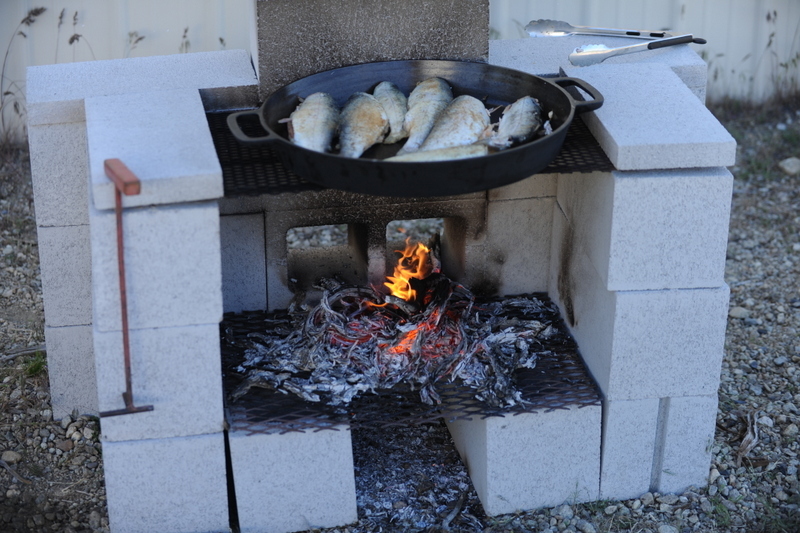 Cover gas or electric burner with a layer of heavy wire mesh and place chiles on hot mesh. Remove chiles once the skin is blistered. Place chiles on gas or charcoal grill, about 5-6 inches above heat source. Remove chiles once skin is blistered. Chill chiles immediately after blistering to ensure food safety. Freeze unpeeled chiles in plastic freezer bags, aluminum foil, freezer containers, or freezer wrap. Freeze immediately and store at 0 degrees or below. To peel chiles after removing from freezer, you can peel either frozen or partially thawed, under running water. Remove seeds and veins at the same time. Remember to wear rubber gloves. ​Just in case you are wondering, chile is the green vegetable and chili is the stew. Beat egg whites with salt until stiff. In separate bowl beat egg yolks, add salt and flour and mix well. Fold the yolk mixture into egg whites just enough to mix. Use quickly, as this batter will separate. Make small slit in the top of the chile and insert cheese. Roll chile in flour to coat. Dip chile into batter. Fry in hot oil until golden brown on both sides. If oil is hot enough, this will only take a few minutes. Drain on several layers of paper towels. Slit chilies down one side, wash to remove seeds, drain on paper towel. Beat together eggs, salt, flour and milk. cook pork in water with salt and pepper and garlic till it falls off bone. Let cool, skim off grease, remove bones and cut up pork into serving pieces. Chop up remaining ingredients and cook with pork in crock pot 12 to 16 hours on low heat setting. Preheat oven to 350 degrees. Combine chicken, cream of chicken soup, milk, New Mexico green chile, salt, pepper, and garlic powder in a saucepan. Bring to a boil and stir. Remove from heat. In a 13" x 9" glass pan layer corn tortillas, chicken sauce and cheese. Add onions to middle layer. Cover with foil and bake for 20 minutes. Uncover and bake an additional 20 minutes or until casserole begins to pull away from side of pan. add cubed halibut and sauté couple more mins. Thaw brisket...coat with 1/2c sugar 1/4c salt and some pepper. Let meat marinate in this combination in the refrigerator overnight. 1 jar (any size, any kind) jam	Slow cook in oven at 300 degrees for two hours. Reduce heat to 250 degrees and finish cooking about 4 hours, or until done. I CAME UP WITH A KICKASS RIB RECIPE. FOR PORK RIBS, START WITH TWO GRANNY SMITH APPLE 1/2" THICK PLACE ROUND APPLES SLICE'S ON TRIVET FOUR OR FIVE PIECES SHOULD DO. USE A RUB YOU LIKE ON RIBS, CUT RIBS SLAB INTO THIRD'S ABOUT FIVE RIBS PER SLAB. PLACE FIRST SLAB BONE SIDE DOWN ON APPLES REPEAT APPLE AND RIBS TO THE TOP OF YOUR DUTCH. ADD TWO BEERS AND A CUP OF ORANGE JUICE. LET IT COOK FOR 2 1/2 HRS. PULL RIBS OUT THE APPLES ARE MUSH "DISCARD" BROWN ON A GRILL ADD BBQ. SAUCE. THEY'LL MELT IN YOUR MOUTH FALL'N OFF THE BONE TENDER AND HAVE A SWEET APPLE TASTE TA-BOOT. Put in 4 cups sugar and a bottle of Louisiana Hot Sauce®. Turn over and let set for two days. Cream together sugar, butter, and oil. Add eggs, buttermilk, and vanilla. Sift together all dry ingredients. Then sift the dry ingredients into the the butter mixture. Add grated zucchini. Stir well. Pour into a greased and floured 9x13" baking dish and sprinkle with the chocolate chips. Bake at a preheated 350 degree oven for 45 minutes or until a toothpick inserted into the center comes out clean. VARIATION: you may use butterscotch chips in place of the chocolate chips. Sift dry ingredients together. Stir up. Add remaining ingredients. Pour into greased Dutch oven. Bake at 375 degrees until done. 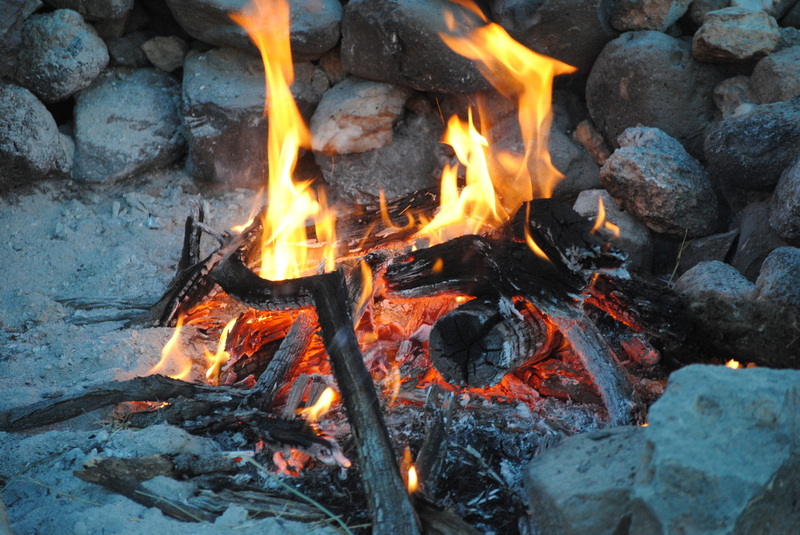 Burn charcoal briquettes until they are covered with white ash. 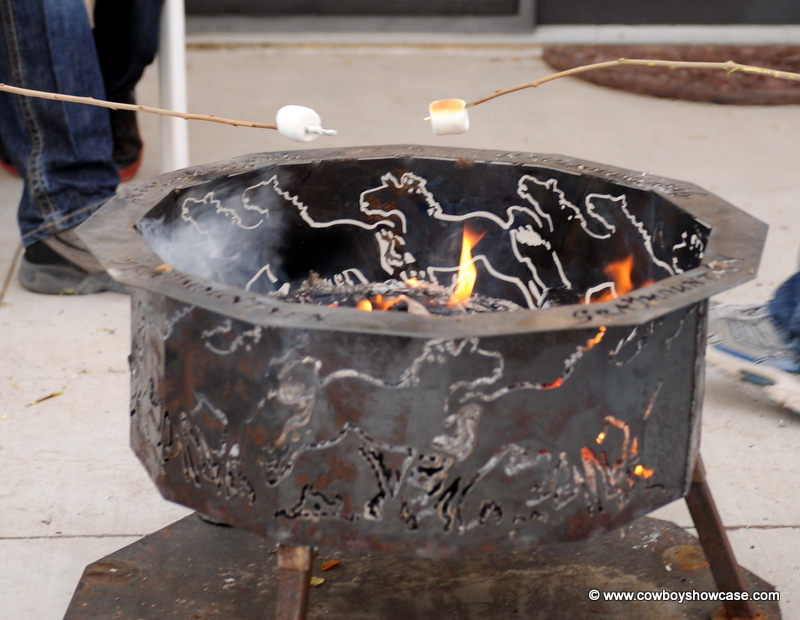 If using a 10-inch Dutch oven, Place 15 briquettes on top and 6 on the bottom. Mix bran, buttermilk, and honey in bowl. Let stand 5 minutes. Mix flour and soda in another bowl. Stir egg, applesauce, and raisins into bran mixture. Add flour mixture and stir JUST until moistened (it may be lumpy) Spoon into muffin tins (2/3 full). Bake at 400 degrees for 18 to 20 minutes. 12-18 muffins. Combine dry ingredients in one bowl, wet ingredients in another. Combine both, stir. Place in Pammed muffin tins. Makes 12 muffins, can be doubled. 1 can Rotel brand tomatoes with cilantro, etc. Chop all ingredients in salsa grinder or coarsely in a blender. Heat and mix over gentle heat or in the microwave until butter and jelly are melted and fully blended. Serve over game birds like chuckar or on venison. Takes away any gamey flavor. Add 1 cup uncooked quick (or old fashioned) rolled oats. Beat well. Drop cookies 2" apart on well greased baking sheet. CREAM MARGARINE AND SUGARS, ADD EGGS, MILK, VANILLA, BEAT WELL. ADD COMBINED FLOUR, SODA, SALT. MIX WELL. BAKE 9-10 MIN AT 375. FOR BARS USE 13X9 PAN, BAKE 35-40 MIN. 1 tsp cinnamon, 1/2 tsp ginger, 1/4 tsp cloves (or sub 2 tsp pumpkin pie spice). In large bowl, beat cream cheese on medium speed of electric mixer until fluffy. Add sugar and spice. Beat until combined. Add eggs, one at a time, mixing until just combined, after each addition. Stir in Pumpkin. Pour into crust. Bake at 350F for 35-40 minutes until center is almost set. Cool for 1 hour on wire rack. Refrigerate at least 3 hours. Garnish as desired and store in refrigerator. 10 servings. Directions: In small mixing bowl, beat cream cheese on medium speed with electric mixer until fluffy. Add sugar and vanilla. Beat until combined. Gradually beat in chocolate. Stir sour cream into chocolate mixture. Fold in one cup of whipped topping. Spread mixture into crust. Refrigerate at least 3 hours until set. Garnish with remaining whipped topping. Store in refrigerator. Cream butter until fluffy and add sugar gradually; beat until fluffy; add other ingredients in order, dissolving the soda in the hot water; mix well; drop by teaspoonfuls on greased cookie sheet. Bake about 8 minutes or until delicately brown. Makes 3 dozen. Keep layering like this until it fills the bowl. Let is chill for a few hours letting the flavors blend. This is always a hit at our dinners. Also, you can use non alcoholic Baileys if you like. If you want to get "fancy" you can do it in parfait glasses. 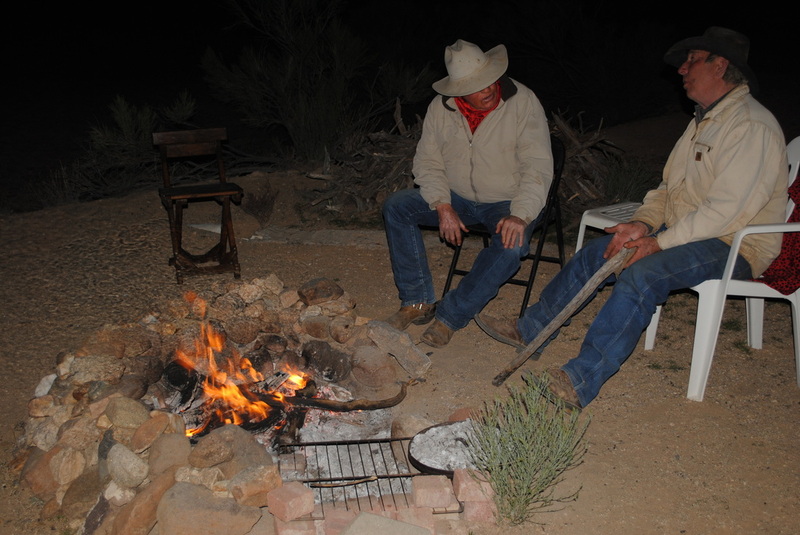 Thanks, I really enjoyed Chuck Wagon Cooking! Preheat oven to 350 degrees. In a large bowl combine flour, sugar, and cocoa. Cut in margarine until crumbly (mixture will be dry), reserving 2 cups crumb mixture, press remainder firmly on bottom of a 13x9 inch pan. Bake 15 minutes. In a large mixing bowl, beat cheese until fluffy. Gradually beat in sweetened condensed milk until smooth. Add egg and vanilla. Mix well. Pour into prepared crust. Combine nuts with reserved crumb mixture. Sprinkle over cheese mixture. Bake 25 minutes or until bubbly. Cool. Chill. Cut into bars. Store covered in refrigerator. Grease 15x10x1 inch baking pan. In a large mixing bowl stir together flour, baking powder, orange peel, baking soda, and salt. Set the flour mixture aside. In a medium bowl, combine eggs and brown sugar. Stir in pumpkin, oil, milk, and vanilla. Stir in carrots and walnuts. Add egg mixture to flour mixture, stirring with a wooden spoon until combined. Spread batter into the prepared pan. Bake in a 350 degree oven for 20 to 25 minutes or until wooden toothpick inserted near the center comes out clean. Cool in pan on wire rack. Spread with orange icing and cut into triangles or bars. If desired, garnish each with a walnut half. Store in an airtight container in the refrigerator for up to 3 days. Makes 36. In a mixing bowl combine 1 1/2 c sifted powdered sugar and enough orange liqueur or orange juice (1-2 tablespoons) to make an icing that is easy to drizzle. Not a set of flavors we in the west are used to, but an outstanding and spicy change. Heat a Dutch oven over medium-high heat. Coat pan with cooking spray. Sprinkle lamb evenly with 1/4 tsp. salt and add lamb to pan. Sauté 4 minutes turning frequently to brown all sides, remove from pan. Add onion to pan, sauté 4 minutes, stirring frequently. Add remaining salt, cumin, cinnamon, red pepper, and garlic. Sauté 1 minute stirring constantly. Stir in honey and tomato paste. Cook 30 seconds stirring frequently. Return lamb to pan. Add apricots and broth. Bring to boil. Cover reduce heat and simmer 1 hour or until lamb is tender, stirring occasionally. Mike said he also has added potatoes, carrots, and celery and a little water. In a large pot over medium-high heat, add the olive oil and bacon. 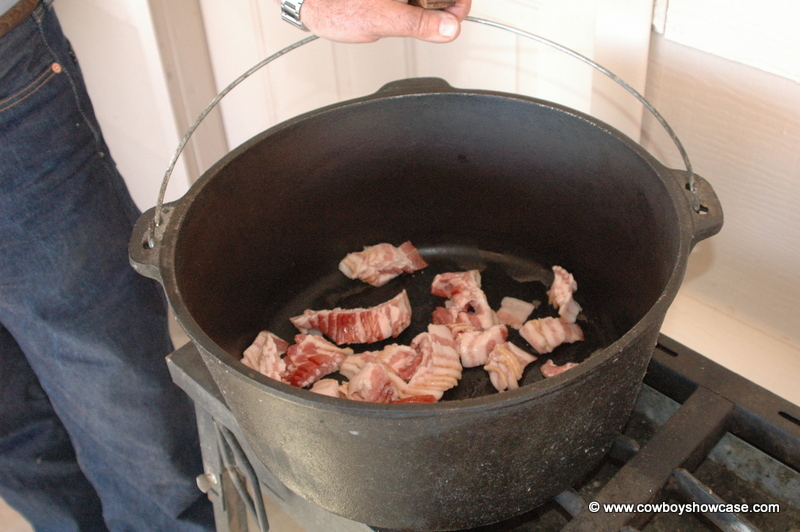 When the becon begins to lightly brown, remove it from the pot with a slotted spoon and set aside. Add the lamb and let the meat brown on all sides, about 3 minutes per side. Remove the meat with a slotted spoon and set aside. Chop the bacon into 1/3” pieces. Add the mushrooms, carrots, garlic, onions and bacon to the pot and stir. Mix in the flour. Add the chicken stock, wine, bay leaves and lamb. Add salt and pepper and cover the pot but leave a vent for the steam to escape. Bring the mixture to a simmer and simmer until the meat is tender and falling apart, about 2 hours. Slowly stir in the heavy cream, parsley, tarragon, peas and Garbonza beans. Cook a little longer then serve. BROWN BEEF AND PORK IN A LARGE PAN OVER HIGH HEAT, SEPARATING WITH A FORK, UNTIL COOKED THROUGH. LOWER HEAT TO MEDIUM AND PLACE WHOLE TOMATOES ON TOP OF MEAT. COVER AND LET SIMMER 10-15 MINUTES. REMOVE TOMATOES, PEEL AND DICE THEM, AND RETURN TO PAN WITH THEIR JUICE. STIR IN REMAINING INGREDIENTS AND MIX WELL. COVER AND SIMMER 20-30 MINUTES OR UNTIL THE MIXTURE IS WELL BLENDED AND THE RAISINS ARE PLUMP. YIELDS 12-18 SERVINGS. SPOON MIXTURE INTO WARMED FLOUR TORTILLAS, OR USE AS A DIP WITH TOSTADOS. THIS CAN BE MADE AHEAD AND REFRIGERATED FOR A WEEK OR FROZEN FOR UP TO THREE MONTHS. drain liquids off of corn and beans. Cube the block of cheese. Mix all ingredients, then add dressing. Mix well. Mix these ingredients until smooth. May be kept in the freezer indefinitely. Thaw before using. In a cup, like a small coffee cup, add 1/3 cup above mix; a shot of rum, brandy, whiskey or other spirit, if desired; fill with boiling water. Great for the holidays or cold days. Punch dough down and knead on a floured board to form a smooth ball. With a circle of foil, cover the bottom of Dutch oven. Grease foil, inside of Dutch oven, and lid with oil or spray. Bake covered with lid in a 375 degree oven for 12 minutes. 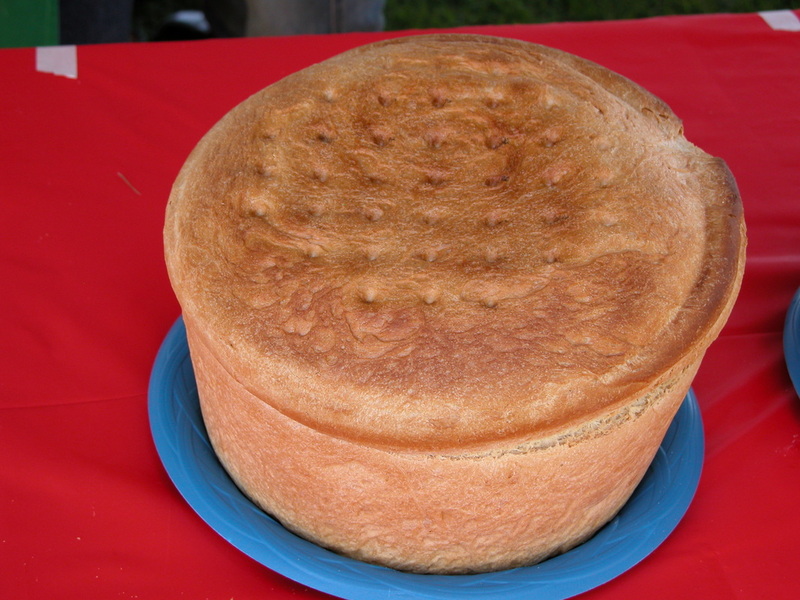 Remove lid and bake for another 30-35 minutes or until loaf is golden brown and sounds hollow when tapped. Remove from oven and turn loaf out onto a rack to cool. (Dutch oven and loaf are heavy and hot so help is recommended) Peel off foil. Makes one large loaf. Most Basque sheepherders baked their bread in a pit with coals from a campfire using a Dutch oven with a recessed lid. For the above recipe Claire uses a #8 Dutch oven. She says this is a little small as she needs to take a portion off and bake separately in a bread pan. Her original recipe called for a 10 inch cast iron Dutch oven, 5 quart size. combine ingredients, mix just until moistened and bake 25 minutes in muffin tins. Makes about 12 muffins. You may add one chopped apple or 1/2 cup raisins or other dried fruit. Mix these ingredients in a small sauce pan and cook on medium heat until clear. Stir as needed. Put vegetables though food processor until desirable consistency. Pour cooked liquid over vegs and allow to cool. Keeps well in refrigerator several weeks. coarsely chop cranberries, combine with other ingredients or chop all in food processor. Slice lemons as thin as possible. Discard ends. Remove all seeds and tie them in a square of doubled cheesecloth. Put lemons and seed bag in a non-reactive bowl with enough water to cover. Let stand overnight. Put marmalade into hot sterile pint or half-pint jars. Store in refrigerator up to one month or for longer storage, seal according to reliable canning instructions. Makes about 6 pints. This is definitely not a "Weight Watchers' " version, but won't taste the same with other ingredients. Melt butter mix in rest and bake @ 400 degrees. Blend cocoa with sugar and salt. Add milk to mixture and place over medium heat. Stir until sugar is dissolved and mixture comes to a complete boil. Continue cooking, stirring occasionally until the mixture reaches SOFTBALL stage. Remove from heat, add butter. Do not stir. Allow to cool to luke warm (about 10 minutes) which ever comes first. Then add vanilla and beat until it begins to thicken, hold shape and looses its gloss. Turn into a buttered platter. Cut into squares when cool. Our favorite outdoor BBQ. Quick and inexpensive to build. Safe and easy to regulate. No need to use expensive briquettes or lighter fluid so better flavor in grilled meats.